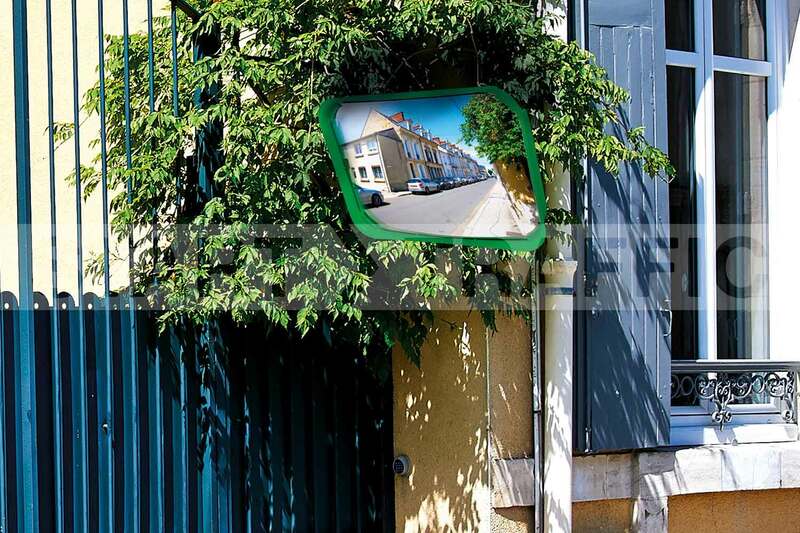 These wide angle multi-purpose safety mirrors are suitable for use in almost all locations, be that inside or outside. Made by VIALUX who take pride in producing the “unbreakable” mirror that can take substantial impacts without showing any damage. These two-way mirrors are perfect for placing on corners, at gates or within factories to facilitate easy viewing around corners. They come with a choice of frame colours, allowing the mirror to blend in, or stand out where required. In addition to the red, green and black shown here, this mirror is also available with a white frame which can be found on this page. Each convex mirror is available in a range of sizes ensuring you can get a mirror that fits within any physical space constraints. Further down the page, we have details of the maximum viewing distance of these mirrors, this distance it recommended maximum the observer should be away from the mirror. Red Frame - Stands out and contrasts against the background in most environments. Green Frame - The frame blends into green backgrounds such as bushes and trees, again making for a discreet install. White Frame - These are used almost anywhere and offer a discreet appearance that blends into most surroundings. Polymir Optics- This is the base option and offers a sharp clear image, with no distortion The frame and lens are UV proof so, will not discolour or go “milky”. POLYMIR Optics feature a 3 year guarantee. PAS Optics- This is an upgrade to the standard POLYMIR optics and has all the same benefits, with the addition of an anti-scratch and anti-static coating. With PAS optics you also get an additional 2 years of warranty! To get the most from your mirror it needs to be installed in the right place, ensure that the mirror is not installed so that it is outside of the maximum viewing distance. It is also important to ensure that you either have somewhere to wall mount the mirror or post mount the mirror. All brackets are included with each mirror for both wall and post fixing, they are also fully adjustable. When properly installed these mirrors are tested to withstanding winds of up to 183km/h. The post mounting kit is suitable for use with 60mm - 90mm posts. We are pleased to be able to offer a site visit and assessment on any of our Mirror range to discuss the needs of your site and asses where mirrors can best improve site safety. If you would like to arrange a no obligation site visit, or just want some help and guidance then please call 01905 794 875 and speak to one of our customer service team.